If you’ve got an old piece of furniture lying around that’s seen better days, don’t just chuck it to the kerb; thanks to the best furniture paints, you can really transform it into something that looks brand new. 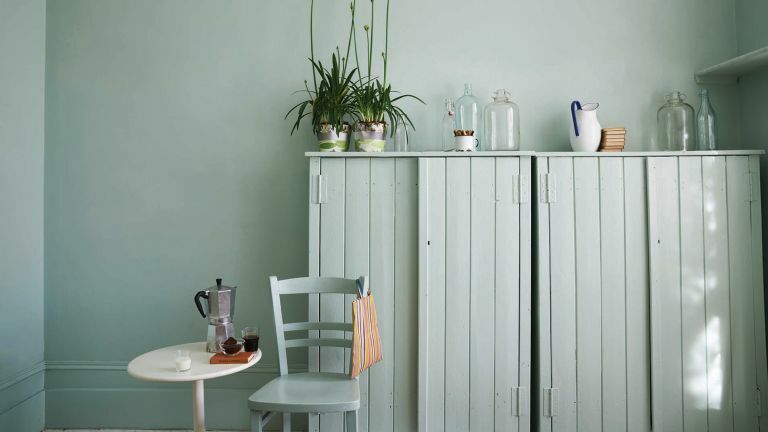 Furniture paints can be used on all sorts of pieces, too, from kitchen cabinets to doors, so are a useful DIY cupboard standby for all sorts of decorating jobs. Interested in more decorating tips and ideas? Head over to our decorating hub page. WHAT IS THE BEST FURNITURE PAINT? We think the best furniture paint you can buy is the Rust-Oleum Chalky Finish Furniture Paint. It requires no sanding or priming before use, it's available in a range of over 30 different colours and it's easy to apply and doesn't smell that bad. Winner! However, If shabby chic is your thing, then it's chalk paint, such as the Rust-Oleum Chalky Finish Furniture Paint, that you’ll want, as it gives a smooth matt finish which can be altered and distressed until you achieve your desired look. If you’d prefer a pristine block colour with a nice glossy sheen, then satin paint is the best way to achieve this. The Ronseal Satin Cupboard Paint gives a nice silky finish to furniture if thats the look you are going for. There are a few different types of paint for furniture, and the one you choose all depends on the final look you are going for. We have focused on the two most popular paint finishes for DIYers when it comes to transforming your old furniture into something spectacular: satin and chalk. Check the furniture paint you've chosen is available in a range of colours so that whether you want to go daring or neutral, you have lots of choice. For all things paint related, check our dedicated hub page. If you want to give a DIY project a go but don’t have loads of time to spend on it, then this chalk paint is a great go-to for easy furniture painting. No sanding or priming is required before application, and it’s a water-based colour which doesn’t smell too potent, so this could easily be applied indoors with just a few sheets of newspaper laid down for protection. This does however mean that it can only be used on interior furniture, as the paint would not fare very well in the elements. With over 30 colours to choose from, including classic Antique White, Mustard, Pumpkin and Winter Grey, there is a range of possibilities for transforming your old furniture into something truly unique. In our opinion, this is the very best furniture paint for those who want to achieve the shabby chic look. Do your kitchen cupboards look a little worse for wear? If so, then this Satin Cupboard Paint can quickly and easily make them look brand new again. This is a durable paint that goes on nicely and only takes two hours to dry. Once applied, it won’t knock or scratch and it’ll leave a smooth, silky finish that won’t show any signs of brush marks. This paint comes in a grey colour, so if you’re looking to change up your old white cupboards, then this neutral colour could be just the thing to smarten up the home. This multi-surface paint in Petrol is a bold colour that can be used on anything from cupboards to wardrobes, tables and chairs. It’s a satin paint that will give a smooth, silky finish with no brush marks in sight. It only takes four hours to dry and once dried is highly durable to knocks and scratches, so you can expect pristine, glossy furniture that stays looking newer for longer. The best furniture paint for bold colour blocking, we think. This super high-gloss paint is for use on a multitude of surfaces and there is no need to prime or sand down the furniture before application. It’s highly concentrated, meaning a little goes a long way with this paint, and you’ll find it’s slightly shinier than the standard satin paint. It comes in a wide range of bold colours such as black and grey – perfect if you love dark and atmospheric interiors. Many DIY guides will tell you that when you are creating a distressed look, you will need to sand, prime and then wax the furniture in question before and after applying the paint. However, if you don’t have time for all those steps, then this chalky furniture paint will make life easier. It glides on to give a flat, matt finish that is strong enough to withstand wear and tear and will not rub off with general use unless you have specifically distressed it that way. It also only takes 30 minutes to dry, so this is the perfect paint for a quick upcycling job. If you’re on a budget, then Johnstone’s chalk paint the best furniture paint for an affordable option and it comes in five different pastel shades that you can use to create a light and airy atmosphere in your home. The paint can be used on anything, from furniture to cupboards and even accessories, and is said to apply easily and dry quickly to a knock-and-scratch-resistant finish. For use on walls, furniture, woodwork or accessories to give a decorative matt colour finish, this water-based paint has virtually no smell, and just one coat will hide the most hideous paint job. There's no need to sand or prime your surface beforehand, and one coat takes only two hours to try, so you'll be able to use your updated piece of furniture in no time. Why not update your garden furniture too with a chalky-finish paint?